There’s been press recently that astronomers have discovered a “spooky” or “mysterious” alignment of quasars across the universe. While such claims make great headlines, the new results aren’t spooky at all, nor are they that mysterious. They are somewhat interesting, so it’s worth discussing. The headlines are based on a new paper in Astronomy and Astrophysics that looks at the polarization of quasars in large cosmic structures. 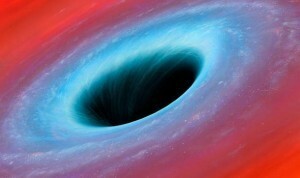 A quasar is an intense source of energy powered by a supermassive black hole in the center of a galaxy. Often the light from a quasar is polarized, meaning it has a particular orientation. This new paper looked at the polarization of 93 quasars with good data. It turns out that there are two ways that quasar light can be polarized. The first is due to the diffuse gas and dust between the quasar and us. Lots of light sources are polarized by the interstellar medium, and quasar signals are no exception. 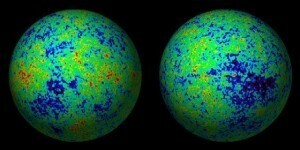 The second is that the quasars can be inherently polarized. This second case is useful because inherent polarization is typically either parallel or perpendicular to the rotational axis of the black hole and surrounding galaxy, so knowing the polarization you know something of a galaxy’s rotational alignment. We can’t always tell the difference between the two types of polarization, but when the polarization is particularly sharp, it’s almost always due to an inherent polarization of the quasar. Of the 93 quasars in this particular study, 19 had sharp polarizations. So the authors looked at these 19 quasars, and found that their inherent polarizations tended to align with the structure of their galaxy clusters. 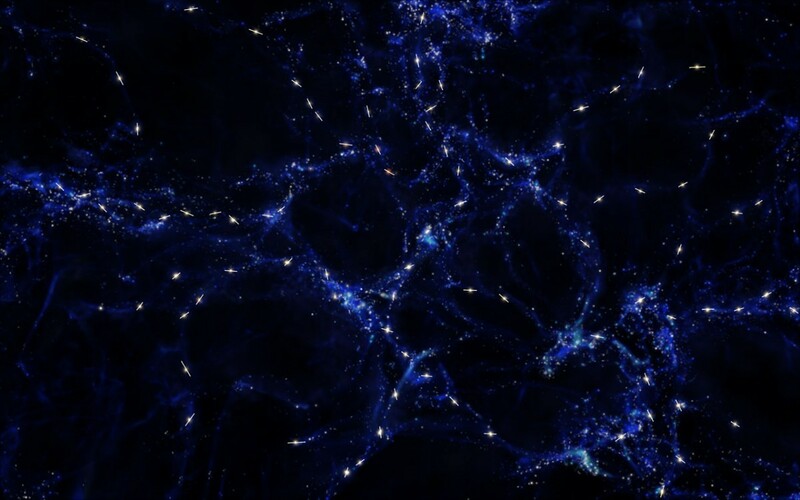 On very large scales, the universe tends to be super large clumps of galaxies connected by diffuse filaments of stars and galaxies. So the quasar polarizations tended to align with the filaments. This would imply that their galaxies are also aligned with the filaments. The odds of this happening purely by chance is about 1%, which makes it unusual, but not astoundingly so. What’s more interesting is that these filaments can span billions of light years, so the quasar alignments are over the same range. Does that make it spooky? Not really. In fact computer simulations of cosmic evolution actually predict some correlation between filaments and galaxy alignment. This new work is the first observational evidence of such an alignment. The level of observed is somewhat higher than predicted levels, which could suggest a deeper underlying mechanism, but the evidence isn’t strong enough to make that conclusion solid. So what we’ve found here is not something spooky, it is just evidence of more complexity within the structure of the universe. Keep up the good work! You described this better than the magazine article I read. It’s hard to judge the merits of after-the-fact explanations. The alignments weren’t predicted by anything prior to the observations. There’s talk about numerical models of evolution of the universe predicting quasar alignments. But those models are constructed from earlier empirical surprises. It’s legitimate science, but just to remind that it’s primarily after-the-fact, and that’s millions miles from predictions that surprise and shock everyone including the theorist, yet prove correct. When was the last time the cosmological model produced something like that? Or anywhere in science. Answer: not for decades.